In Hancock Park, the former Girasole is reopening as Vernetti. Chef Steve Vernetti will dish up Italian-American classics such as house-made pastas including tagliatelle, rigatoni, penne, papperdelle and ravioli. Other dishes will include fried polenta with yam and sage, whole-roasted branzino, and passionfruit cheesecake. Vernetti, 225 N. Larchmont Blvd., Los Angeles, CA 90004, 323-798-5886. Ari Kahan and executive chef Kayson Chong (BOA Steakhouse) have opened the Mainland Poke Shop on West Third Street, featuring bowls of Hawaii’s iconic marinated raw fish dish. There's takeout and a small number of indoor/outdoor seats. Mainland Poke Shop, 8318 ½ W. Third St., Los Angeles, CA 90048, 323-452-9904. In Brentwood, the contemporary steakhouse Baltaire has opened, featuring a spacious dining room, an intimate fireside lounge with a baby grand piano, and al fresco dining on the sprawling 2,500-square-foot outdoor terrace. Executive chef Travis Strickland (Chicago Cut Steakhouse) showcases Prime meats cooked on imported French Montague broilers at a radiant heat of 1,600°F. Highlights include A5 Japanese Wagyu, a porterhouse for two, and a dry-aged côte de boeuf. Tableside preparations including sautéed dover sole fileted and deboned in French copper pans, and a Greek salad completely prepared on the spot. Beverage director David Vaughn (Osteria Mozza) offers a New and Old World wine list, and the cocktail menu features contemporary interpretations of Prohibition-era classics. Lunch & Dinner daily. 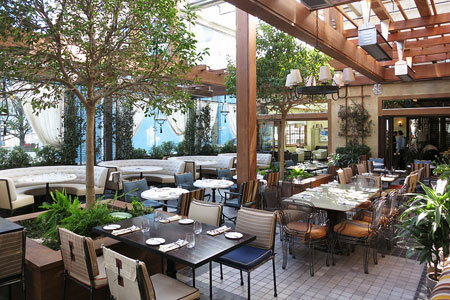 Baltaire, 11647 San Vicente Blvd., Brentwood, CA 90049, 424-273-1660. Pure by Michèle La Porta in Beverly Hills aims to be a healthier alternative to fast food. The seasonal menu has a local, sustainable focus. Pure by Michèle La Porta, 252 S. Beverly Dr., Beverly Hills, CA 90212, 424-248-7424. Bombo, from chef Mark Peel (Campanile, The Tar Pit), is a "broth-based seafood concept" at Grand Central Market in downtown Los Angeles. Expect dishes like curried shrimp, steamed mussels and seared yellowtail. Bombo, Grand Central Market, 317 S. Broadway, Los Angeles, CA 90013, no phone. Spacecraft Group and designer Kris Keith are designing Trejo's Tacos, a new modern Mexican cantina and restaurant from actor Danny Trejo. The 1,000-square-foot space will feature Mexican-themed murals made from custom tiles and will include outdoor seating. Trejo's Tacos, 1048 S. La Brea Ave., Los Angeles, CA 90019, no phone. Neal and Amy Knoll Fraser, along with pastry chef Mariah Swan, will open icdc, an ice cream, doughnut and coffee shop next to BLD. icdc, 7450 1/2 Beverly Blvd., Los Angeles, CA 90036, 323-930-9744. Farewell, cupcakes; hello, gelato! The former Crumbs Bake Shop in the Hollywood & Highland Center will be the site of the second California location for Grom. (The other branch can be found at Malibu Country Mart.) The Italian gelato company takes pride in using high-quality, natural ingredients and no added flavorings, colors or preservatives. Grom, 6801 Hollywood Blvd., Los Angeles, CA 90028, no phone. Chef Scott Zwiezen of Elf Café has opened Dune, a Mediterranean counter service spot (with sidewalk seating) in Atwater Village on Glendale Boulevard. Find organic falafel on made-to-order pita, a beet sandwich and a lamb sandwich. There are sides like rosewater dates and taboulleh, and iced tea and ginger kombucha to drink. Dune, 3143 Glendale Blvd., Los Angeles, CA 90039, no phone. Alex Chu’s (Dim Sum Truck) brick-and-mortar takeout shop, New School Kitchen, has opened on Sawtelle in West L.A. Find dim sum-like pork and shrimp dumplings, curried chicken buns, Taiwanese pork belly buns and Hainan chicken rice. New School Kitchen, 11301 W Olympic Blvd., Los Angeles, CA 90064, 424-832-3445. 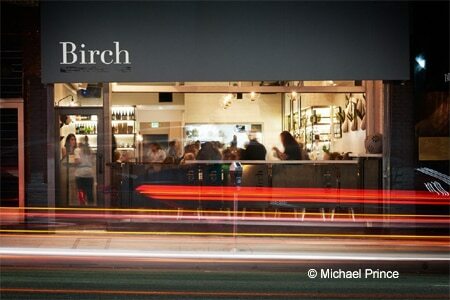 Chef Brendan Collins (Waterloo & City) has opened his new restaurant, Birch, in Hollywood on Cahuenga Boulevard. Expect a modern, Scandinavian look with a back patio, and a sophisticated menu of rotating small plates including duck confit, monkfish with cucumber salad and quince, foie gras and charcuterie, as well as a tasting menu. There's beer on tap, a small wine selection and barrel-aged cocktails. 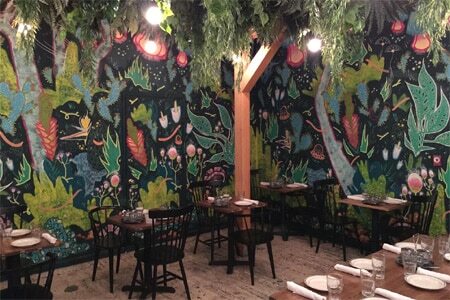 Birch, 1634 Cahuenga Blvd., Los Angeles, CA 90028, 323-960-3369. Echo Park’s stylish new British pub, The Lost Knight, is now open for lunch and dinner, with classics like sausage rolls, Welsh rarebit, and fish and chips, as well as more ambitious fare including a trout pie in puff pastry, duck confit and “beet” Wellington. To drink, expect loads of British and local draught beers, but also a select wine list and classic cocktails like the Vesper and the Bramble. Lunch & Dinner daily. The Lost Knight, 1538 Sunset Blvd., Los Angeles, CA 90026, 213-278-0408. Asa Meza has opened in the former Lexington Social House space, where a large patio garden with Japanese lanterns beckons summer. Chef Joey Lopez dishes up an Asian-Latin menu of small and large plates, ranging from piquillo peppers with crab stuffing and saffron emulsion sauce and seabass ceviche to braised pear and marinated short ribs. Craft cocktails include the “Oaxacan Sunshine,” featuring roasted red pepper, cherry tomatoes, sage, lemon, agave and Vida mezcal. Lunch & Dinner daily. Asa Meza, 1718 Vine St., Los Angeles, CA 90028, 323-538-2700. Fifteen years after the opening of La Casita Mexicana, chefs Jaime Martin Del Campo and Ramiro Arvizu bring their much-loved Mexican flavors and heirloom recipes to South Los Angeles at Mexicano, located in the Baldwin Hills Crenshaw shopping center. Menu highlights include a cooked-to-order tamale, Nayarit cod ceviche, and guavas marinated in a Mexican-style eggnog. Mezcal-based cocktails include the "Placero," made with cactus, lime and chicharrón salt. Lunch & Dinner daily. Mexicano, Baldwin Hills Crenshaw Shopping Center, 3650 Martin Luther King Jr. Blvd., Los Angeles, CA 90008, 323-296-0798. B.S. Taqueria, a project from chef Ray Garcia (Broken Spanish), will open for lunch on April 2, 2015, in the former Mo-Chica space in downtown Los Angeles. B.S. Taqueria, 514 W. 7th St., Los Angeles, CA 90014, 213-622-3744. The former Mo's space has been turned into Continental. Executive chef Jesse Genovese presents a contemporary menu with global influences, including dishes like Moroccan chicken, Vietnamese-style banh mi and an Angus beef burger with crispy pancetta, tempura-fried dill pickles and white cheddar cheese. Continental, 4301 W. Riverside Dr., Burbank, CA 91505, 818-845-3009. Nick & Stef’s Steakhouse downtown is featuring a fun Unofficial Mad Men Power Lunch to savor the end of the hit series Mad Men. At lunchtime, enjoy the likes of a classic shrimp cocktail, deviled eggs, steak Diane and cherries jubilee --- and don’t forget the tableside martini. Nick & Stef’s Steakhouse, 330 S. Hope St., Los Angeles, CA 90071, 213-680-0330. California Pizza Kitchen is celebrating its 30th anniversary! CPK opened in Beverly Hills on March 27, 1985, revolutionizing how people thought of pizza with such innovations as the BBQ Chicken Pizza. 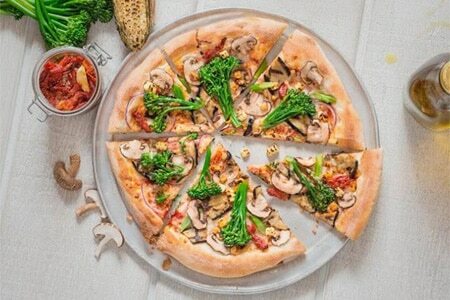 Now located in 208 cities and 15 countries, these pizza pioneers continue to evolve by focusing on creating sustainable environments incorporating natural elements while updating their menu with new dishes that focus on freshness, bright flavors, and menus that change with the seasons. CPK has also released a cookbook, California Pizza Kitchen Taste of the Seasons, that's available for purchase at the restaurants. For more information, visit California Pizza Kitchen's web site. California Pizza Kitchen, 207 S. Beverly Dr., Beverly Hills, CA 90212, 310-275-1101. Maverick chef Roy Choi’s upcoming healthy fast food spot in Watts, Loco’L, is under construction. Choi (Kogi, POT) has teamed up with San Francisco chef Daniel Patterson (Coi), who will also open a Loco’L in San Francisco’s Tenderloin district. The chefs share a goal of “revolutionizing” fast food. Healthy burgers will be made with grains and tofu, buns will be nutrient-dense, and they will be priced at only 99 cents. Choi insists there will be no sodas, only agua frescas. Loco'L, 1950 E. 103rd St., Watts, CA 90002, no phone. Chic Caheunga corridor haunt Madera Kitchen has debuted a new wine room, open nightly with a special tasting menu from chef Vanessa Lauren (Petit Trois, ABC’s "The Taste"). The wine room tasting menu ($50 per person) is a special project from Lauren, and features fresh oysters, bone marrow crostini, pappardelle with duck ragu and morels, braised oxtail over beet yogurt and roasted baby vegetables, and chef’s choice dessert. Wine pairings are also available. The room seats 20 people, and reservations are recommended. Madera Kitchen, 1835 Cahuenga Blvd., Hollywood, CA 90028, 213-261-3687. A Baja-inspired brunch menu is being served up on weekends at solita Tacos & Margaritas in the Westfield Valencia Town Center. 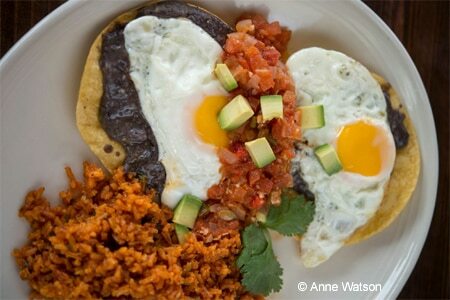 Dishes include huevos rancheros, a fruit plate with Greek yogurt and agave, and a breakfast burrito. All entrées are offered with a small side of black or pinto beans, Spanish rice or signature slaw. There are also mimosas, sangria, Bloody Marys and more available. solita Tacos & Margaritas, Westfield Valencia Town Center, 24201 Valencia Blvd., Ste. 3470, Valencia, CA 91355, 661-291-1399. COCHON 555, a traveling culinary competition and tasting event, heads to the Viceroy Santa Monica on March 29, 2015. GAYOT's Sophie Gayot will be one of the judges. 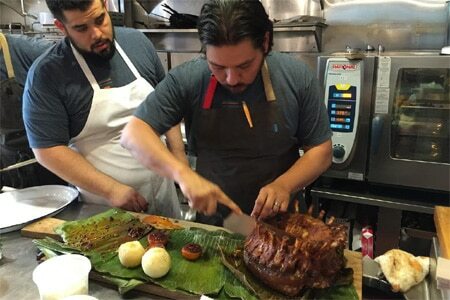 There will also be a chef's course dinner on March 27th and a large format feast on March 28th with the 2014 "King of Porc," chef Ray Garcia (B.S. Taqueria, Broken Spanish). For more information, visit the GAYOT blog. Viceroy Santa Monica, 1819 Ocean Ave., Santa Monica, CA 90401, 310-260-7500, 800-622-8711. Foie gras from a food truck? That’s right! 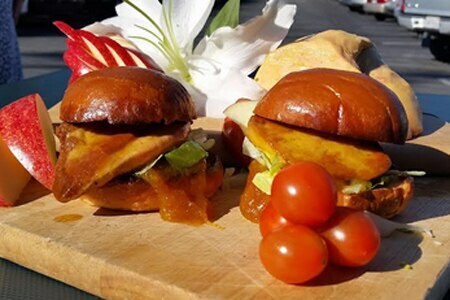 Now that foie gras can be served again in California, Fair Game food truck will be offering chef Jean-Paul Peluffo's signature foie gras and lobster slider. It will be available in Los Angeles on March 6, 2015. Visit Westchester's First Friday event (6200 block of W. 87th St., Los Angeles, CA 90045) from 4 p.m.-9 p.m. The former Paiche space in Marina del Rey has been turned into Catch & Release, a seafood restaurant from chef Jason Neroni (formerly of Superba Snack Bar) and restaurateur Bill Chait. Catch & Release, 13488 Maxella Ave., Marina del Rey, CA CA, 310-893-6100. Richard Sandoval’s Latin spots La Sandia and Zengo, located atop the third floor of Santa Monica Place, have closed to make way for a new location of The Cheesecake Factory. La Sandia, Santa Monica Place, 395 Santa Monica Place, Santa Monica, CA 90401, no phone. RivaBella closed March 15, 2015, to make way for ROKU, a new Japanese restaurant from Innovative Dining Group. Expect favorites from the Sushi Roku menu as well as teppanyaki. RivaBella, 9201 Sunset Blvd., West Hollywood, CA 90069, 310-278-2060.